An engineering firm in Keighley, specialising in the design and manufacturing of foundry equipment, has slashed the time it takes to send online business critical data from an hour to a matter of minutes thanks to an upgrade to superfast broadband. Acetarc Engineering is one of nearly 21,000 homes and businesses in and around Keighley now able to access superfast speeds of up to 80 Mbps since the local phone exchange was upgraded to fibre broadband. The family-run firm, which was established more than 50 years ago, produces mainly molten metal handling and pouring equipment. Although based in West Yorkshire it has a global presence, with more than 80 per cent of its products exported abroad to be used in foundries across the globe. Steven Harker, senior director of Acetarc, said: “We were becoming increasingly frustrated with our broadband speeds prior to upgrading to superfast. It was becoming difficult to work effectively and efficiently especially with our upload speeds which were only around 1Mbps and almost impossible to work with. 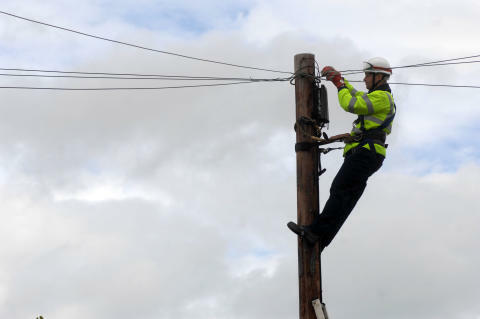 Keighley phone exchange was first upgraded to fibre broadband as part Openreach’s commercial roll-out of the technology in 2012 but not all homes and businesses in the area benefitted immediately. Since then the multi-million pound Superfast West Yorkshire & York broadband partnership has been filling the gaps and as a result hundreds more homes and businesses in the Keighley area can now access superfast broadband speeds via their chosen broadband service provider. And further expansion is set to follow later in the programme. Cllr Peter Box, chair of West Yorkshire Combined Authority‘s Investment Committee, said:“The huge benefits that Acetarc Engineering have seen clearly show how important the superfast broadband project is to meeting the Combined Authority’s aim of creating economic growth and jobs across West Yorkshire and the city region. Steven Harker added: “Superfast broadband is a huge asset for us. It may only be there in the background but it works and allows staff to simply get on with their jobs and be more productive in the time they are saving. More than 850,000 households and businesses in West Yorkshire now have access to high-speed fibre broadband as a result of Superfast West Yorkshire & York and Openreach’s own commercial fibre broadband programme. It’s an ‘opt in’ service, but because the Openreach network is ‘open’, residents and businesses wanting to upgrade have a wide choice of fibre broadband providers. Along with West Yorkshire Combined Authority, Bradford Metropolitan District Council, Calderdale Council, Kirklees Council, Leeds City Council, Wakefield Council, and York City Council, are working with BT to extend high-speed fibre broadband to 98 per cent of households and businesses across the majority of West Yorkshire and York by the end of 2018. In total, £34.74 million has been invested in the Superfast West Yorkshire & York programme. This is made up of Government funding from Broadband Delivery UK and funding from the European Regional Development Fund (ERDF), BT and the five West Yorkshire local authorities and City of York Council.